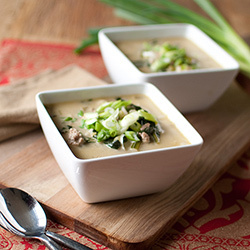 Cold, rainy weather always manifests a craving for warm, hearty meals with good reason! It always seems to warm the bones, and comfort us. It was such a day yesterday, and while I was out and about, I couldn’t get this soup out of my brain! It’s hearty, yet still on the lighter side, and so comforting. I love me a good soup! They are so flavorful, easy to prepare, and generally very easy on the waistline. It’s a perfect dish to contrast the heavy holiday consumption, as well as a great way to start the new year! I really hope you enjoy this dish! Tell me, do you have a favorite comfort food for these cold winter days? 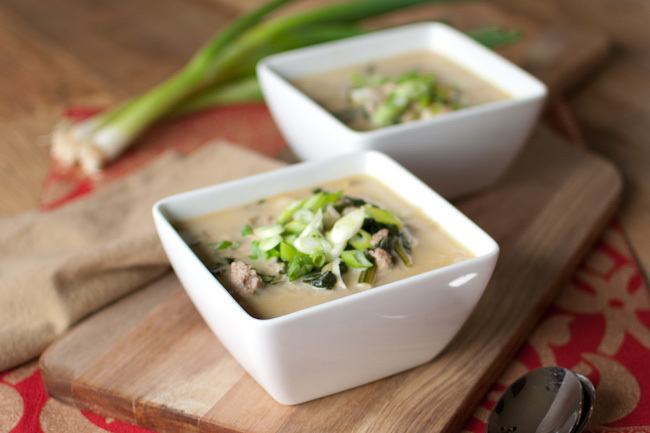 Pasilla and serrano chiles with the addition of cream cheese gives this turkey soup a unique twist! In a large pot over medium heat, add the olive oil, onions, celery and pasilla pepper, sautéing until the onions are translucent, about 8 minutes. Add in the turkey, garlic, salt and pepper, breaking up the turkey as it browns, until the turkey is fully cooked, about 7 minutes. Add the spinach, and stir until wilted. Pour in the chicken stock, cauliflower, potato, and beans with their juices, and bring the mixture up to a boil. Once boiling , add the cream cheese and stir until it is melted into the soup. I used a whisk to help the process. Divide among four bowls, and top with sliced green onions. I love these ingredients: serrano and pasilla chiles, cream cheese–who wouldn’t love it! Can’t wait to try this. Thanks! Absolutely, Vespa! I hope you enjoy! P.S. My favorite cold day yummy delish treat – my dad’s chili. Seriously – those are two of the scrumptious delicacies I miss about being there 😉 Even if he gave me the recipes, I don’t know if I could ever make them as good as he does! Oh, I hear ya! Meals made by mom or dad never come out the same when you make them yourself! 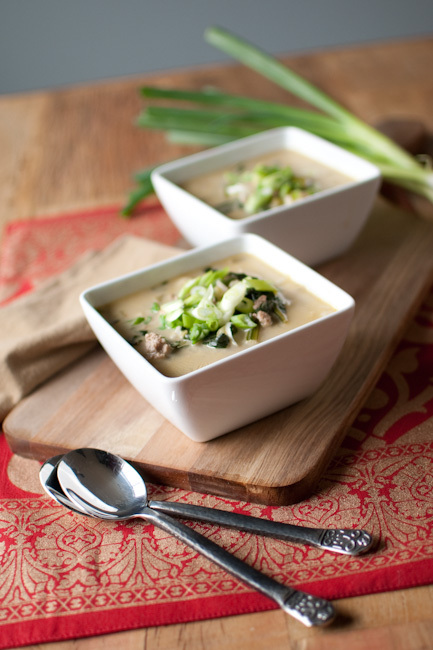 I hope you make this soup, and enjoy it as much as we did! You had me at chilies and cream cheese. This sounds wonderfully tasty. Funny how when it gets cold, we start craving soup. Got to go make some now. I hope you enjoy it, Lynne!! I could have used some of that when it was raining, but I was on the road. Put some in a thermos, and you’re set! You’d love this one being the spinach lover you are!